rows="n" - Required attribute. 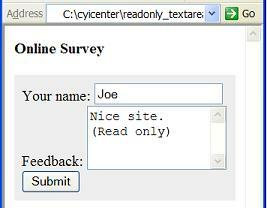 Used to specify the number of rows of the text input area. cols="n" - Required attribute. Used to specify the number of columns of the text input area. name="fieldName" - Optional attribute. Used to specify the name of the text input area. readonly="readonly" - Optional attribute. Used to specify that the input data to be displayed as read-only, not editable.